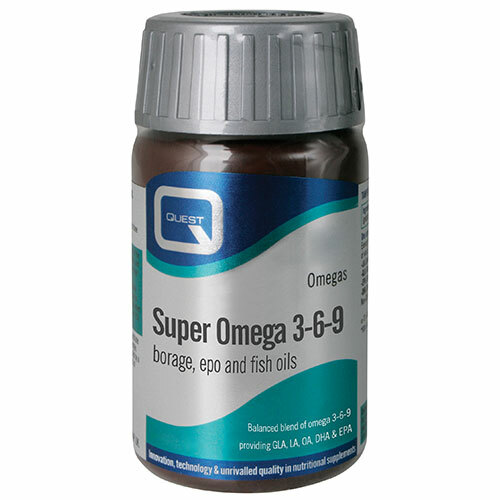 A balanced blend of omega 6 fatty acids gamma linolenic acid (GLA) and linoleic acid (LA) combined with omega 3 fatty acids eicosapentaenoic acid (EPA) and docosahexaenoic acid (DHA). Also naturally contains the omega 9 fatty acid oleic acid. Additionally, evening primrose oil - which this product contains - is indicated in the symptomatic relief of atopic dermatitis. It is recommended that post-menopausal women and the elderly consider supplementing with essential fatty acids, such as Quest Cod Liver Oil Omega 3 Fatty Acids, to protect heart, skin and joint health. Evening Primrose Oil, Borage Oil, Fish Oil, Capsule Shell: (gelatin [from bovine], glycerin), Vitamin E (from soya). As a food supplement take two to three capsules daily with food. Swallow with water. 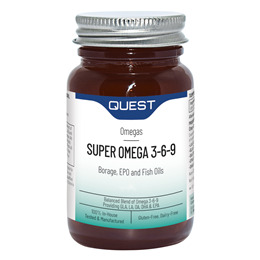 Below are reviews of Quest Super Omega 3-6-9 - 90 Capsules by bodykind customers. If you have tried this product we'd love to hear what you think so please leave a review.